Saturday at ASH saw 6 oral presentations on data from our landmark CoMMpass Study! Much of the data presented today advanced our understanding of the mechanisms that drive myeloma cell growth and survival as well as the mechanisms that drive relapse. The information presented today is another step forward in providing myeloma patients the right treatment based on their own specific disease profile. The information presented ranged from predictors of high-risk disease to light chain amyloidosis. This information could help clinicians select specific immune-targeted therapies for patients with high expression of this protein. For now, the HLA-E marker remains experimental. We switch gears for a bit to focus on light chain amyloidosis (AL). AL is when cancerous plasma cells (the cells that produce antibodies) produce misfolded light chains (a part of the antibody) that then become lodged in tissues of the body such as the heart or kidneys. 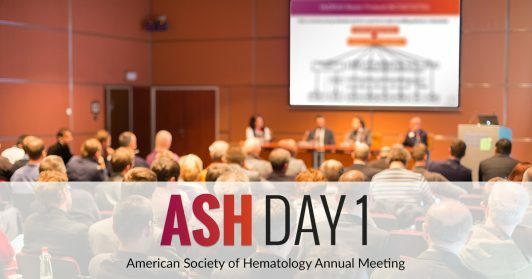 Dr. Dirk Hose from Heidelberg, Germany presented his work on whether there are any genetic features of amyloidosis that distinguish it from monoclonal gammopathy of undetermined significance (MGUS), smoldering myeloma (SMM), and active myeloma that might aid in prognosis. He found that prognosis is determined by specific amyloidosis factors (such as organ involvement, amount of free light changes, and cardiac function), by cancerous plasma cell factors (such as a high growth rate, presence of genetic risk factors) and other factors that represent the amount of cancer cells in the body like M-protein levels. Based on these results, AL is considered an early plasma cell abnormality with an unstable and toxic light chain. The final CoMMpass abstract for the day investigated the genetic profiles of circulating tumor cells (CTCs) with patient-matched bone marrow cells to determine how myeloma cells spread from the bone marrow and into the blood as the disease progresses. Investigators from Spain isolated CTCs and bone marrow cells from 34 patients and analyzed their genetic makeup using various methodologies. Gene expression between the CTCs and matched bone marrow samples were similar and only 45 genes were found to be deregulated in CTCs. These genes were shown to be clinically meaningful using CoMMpass samples. They relate to a more aggressive disease and may represent targets for new drugs that overcome disease progression and dissemination.